From one of my favorite modern decks, “The Cosmic Tribe Tarot”. Stevee Postman (the creator) includes both straight and gay Lovers cards in the deck. I use these cards for gatherings where I know there will be a wonderfully-diverse crowd. We are now in the time of “the twins” of Gemini (May 21 – June 21). This sign is represented by The Lovers in the Tarot (Major Arcana, #6)*. The Lovers may seem obvious at first, but like the dual-personalities of the twins of Gemini, there is a whole other energy at play with this card. This card is all about the choice to be with others, and making those choices out of LOVE for all parties, including you. Choice is making a preferential decision for a path where another path is sacrificed (at least for the moment). The time of Gemini is a period of taking ownership for choices that have been made ,or should be made, for the happiness of all concerned. This can be a choice to commit/recommit, to go your separate ways, or a choice which is made together such as a move, a trip, job, or even dinner. Somebody born under this sign/card may find they struggle with relationships and the choices made for, and within, those bonds. Remember a simple rule that decisions, when relating to ourselves or another, should always be made with love. Also, being born under the suit of Swords, there will often be an underlying feeling, or energy, of mental/emotional struggle and strife; whether, it struggling with a choice, guilt or other “unintended” outcome. Try not to be too hard on yourself or others, and keep your criticisms in check. In the last part of May, you may feel trapped by circumstances or otherwise bound to a situation which you feel you have no way out of. Seek outside help if needed. In early June, give yourself a break! We are always our own worst enemies with criticisms and harsh judgment. Try love instead. By mid-June (around the last 10 days of Gemini), some may feel as if the bottom has dropped out from under them. There may be a complete collapse of plans or a feeling of being taken advantage of. Again, I say, LOVE. Just love. 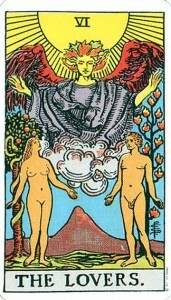 The Lovers represents relationships based on deep love and values. A choice may need to be made, or a path chosen, regarding a relationship. It’s a sign that you must choose what the heart and mind dictate, and sign on for the long haul. Set realistic goals and overcome issues through cooperative efforts. Trust and respect are foundations for the strength and confidence needed by each person involved. Negative energies attributed to those born under this card are imbalance in relationships or the dissolution of unions where your energy is no longer in tune with another. Refusing to take responsibility for your own choices in commitment is often a shadow side for this card. choose with love, gemini, tarot gemini, tarot lovers, the lovers. Bookmark. Does Newton Scientifically Explain Karma?